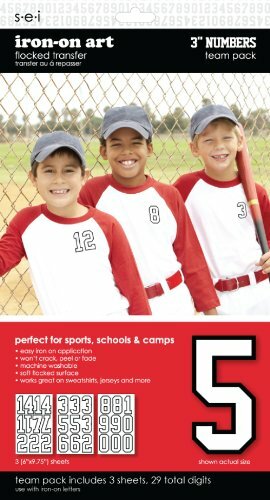 SEI's iron-on flock transfers can be applied to any surface that will withstand the heat of an iron, i.e. wood, fabric, paper, clay, cork and more. SEI-Block Letter Flocked Heat Transfers: White with Black Outline. Transfers can be applied to any surface that will withstand the heat of an iron (wood fabric paper glass clay cork etc.) They are easy to apply and will not crack peel or fade. Since they are made of fabric fibers and not plastisol as many others on the market you never have to worry about washing drying or ironing over designs. Transfers are great embellishments for scrapbook pages as well. Acid and lignin-free. 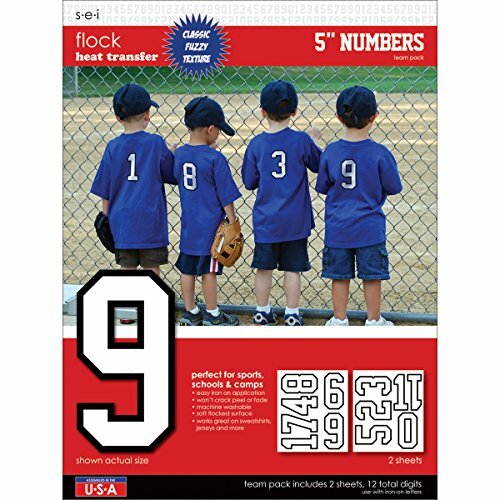 This 10.25x13.625 inch package contains five 9.5x11 inch sheets of twelve 5 inch digits. Ages 12 and up. Made in USA. SEI-Block Letter Flocked Heat Transfers: Black with White Outline. Transfers can be applied to any surface that will withstand the heat of an iron (wood fabric paper glass clay cork etc.) They are easy to apply and will not crack peel or fade. 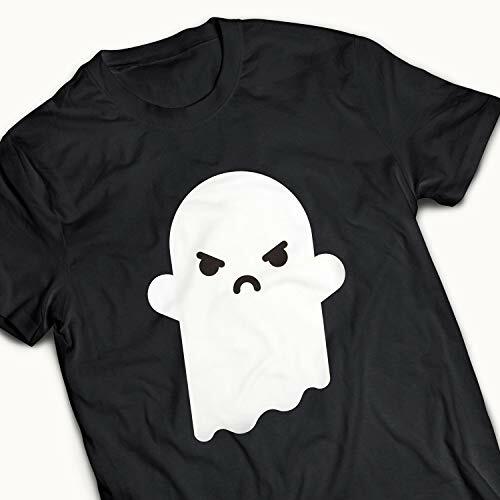 Since they are made of fabric fibers and not plastisol as many others on the market you never have to worry about washing drying or ironing over designs. Transfers are great embellishments for scrapbook pages as well. Acid and lignin-free. 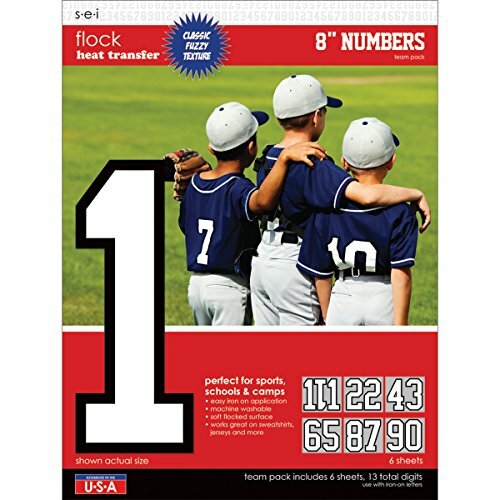 This 10.25x13.625 inch package contains two 9.5x11 inch sheets of twelve 5 inch digits. Ages 12 and up. Made in USA. 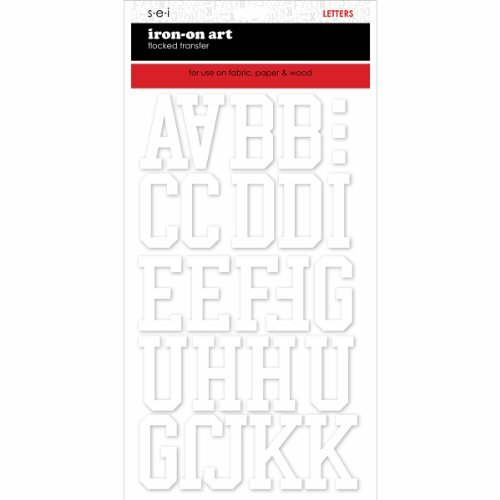 SEI iron ons are durable, easy to apply, perfect to decorate clothing, bags and totes, pillows, paper and so much more. Place right side up in desired location. The colors won't fade and the design won't crack or peel. Test to be sure temperature and timing are appropriate for your fabric. Turn garment inside out to machine wash-cold and air dry. 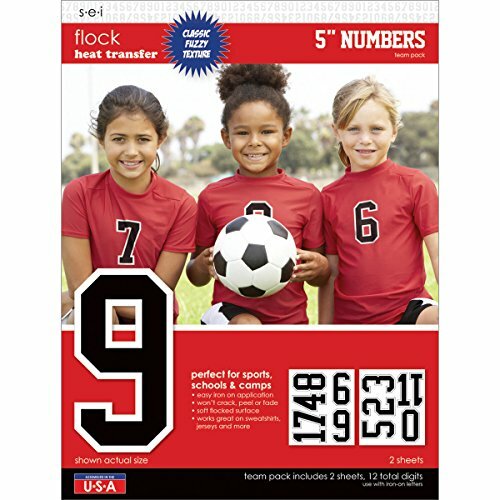 Art transfer numbers team pack 3" white- 29 numbers. 5 of # 1, 4 each # 0, 2, 3, and 2 each of # 4, 5, 6, 7, 8, and 9. White center with a black outline. All 3". SEI-Chunky Letter Transfers. 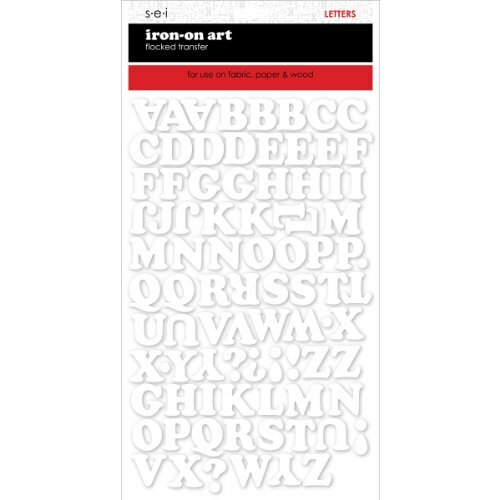 These letters transfers are perfect for adding words or phrases or additional decoration to a variety of projects. They are person for use on fabric paper and wood. 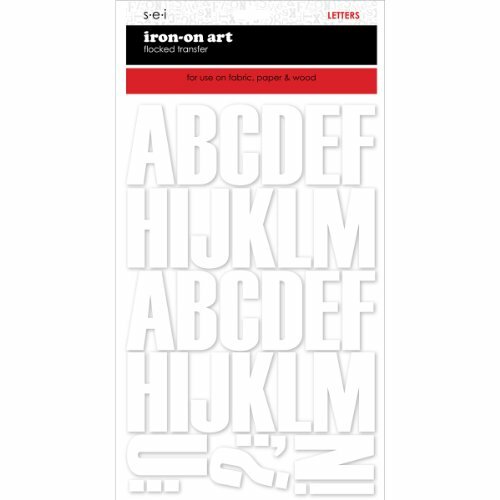 This package contains two 6x9-3/4 inch sheets of 3/4 inch tall letters. Available in a variety of designs each sold separately. Made in USA. SEI-Block Letter Flocked Heat Transfers: White with Black Outline. Transfers can be applied to any surface that will withstand the heat of an iron (wood fabric paper glass clay cork etc.) They are easy to apply and will not crack peel or fade. Since they are made of fabric fibers and not plastisol as many others on the market you never have to worry about washing drying or ironing over designs. Transfers are great embellishments for scrapbook pages as well. Acid and lignin-free. This 10.25x13.625 inch package contains five 8.25x9.25 inch sheets of twelve 8 inch digits. Ages 12 and up. Made in USA. 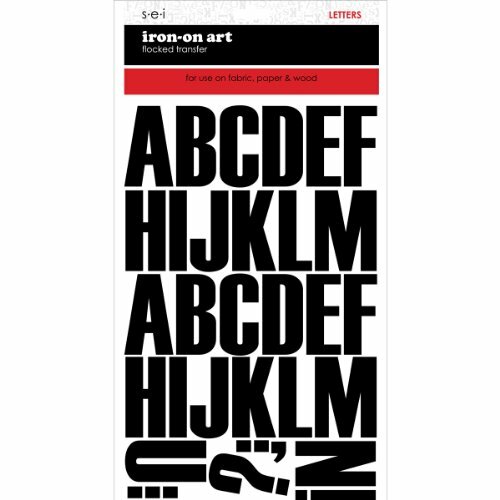 Looking for more Iron Ons Transfers similar ideas? Try to explore these searches: Flap Over Portfolio Computer Case, 3.5 Gallon Closet, and Floss Jumbo Pack. Look at latest related video about Iron Ons Transfers. Shopwizion.com is the smartest way for online shopping: compare prices of leading online shops for best deals around the web. Don't miss TOP Iron Ons Transfers deals, updated daily.